Adelaide Kitchen Gardeners: A glut of tomatoes? So, what do you do with your tomato glut? It would be interesting to hear what YOU do with them. In my next post I will tell you all about preserving them. So, stay tuned! 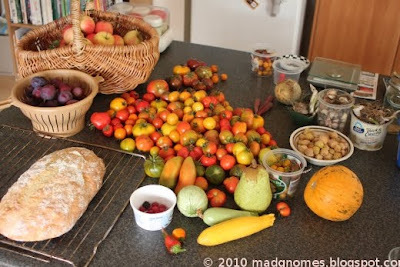 I'd love to have enough tomatoes to equal a glut! What we do enjoy is a simple fresh tomato salad - tomato chunks mixed with fresh chopped basil and finely sliced shallots mixed with olive oil and herb salt. Squashing this mixture a little by hand and letting it stand for a while releases the juices, and makes a pleasant alternative to green salads. If you can afford it, mix in some shredded red salmon from a tin, or maybe tuna. Hanging out for your recipe!